Chemistry 7 Edition NOTE: You are purchasing a standalone product; MasteringA&P does not come packaged with this content. If you would like to purchase both the physical text and MasteringA&P search for ISBN-10: 0321940873/ISBN-13: 9780321940872 . That package includes ISBN-10: 0321943171/ISBN-13: 9780321943170 and ISBN-10: 013389178X/ISBN-13: 9780133891782. For two-semester general chemistry courses (science majors). 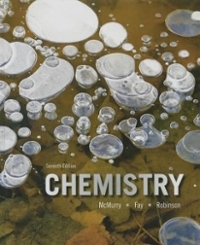 Make critical connections in chemistry clear and visible McMurry/Fay/Robinson’s Chemistry , Seventh Edition, aims to help students understand the connections between topics in general chemistry and why they matter. The Seventh Edition provides a concise and streamlined narrative that blends the quantitative and visual aspects of chemistry, demonstrates the connections between topics, and illustrates the application of chemistry to their lives and careers. New content offers a better bridge between organic and biochemistry and general chemistry content, and new and improved pedagogical features make the text a true teaching tool rather than just a reference book. New MasteringChemistry features include conceptual worked examples and integrated Inquiry sections that help make critical connections clear and visible and increase students’ understanding of chemistry. The Seventh Edition fully integrates the text with new MasteringChemistry content and functionality to support the learning process before, during, and after class. Also Available with MasteringChemistry ® . MasteringChemistry from Pearson is the leading online homework, tutorial, and assessment system, designed to improve results by engaging students before, during, and after class with powerful content. Instructors ensure students arrive ready to learn by assigning educationally effective content before class, and encourage critical thinking and retention with in-class resources such as Learning Catalytics. Students can further master concepts after class through traditional and adaptive homework assignments that provide hints and answer-specific feedback. The Mastering gradebook records scores for all automatically graded assignments in one place, while diagnostic tools give instructors access to rich data to assess student understanding and misconceptions. Mastering brings learning full circle by continuously adapting to each student and making learning more personal than ever–before, during, and after class.